Back l-r: Frank Cogan, John Murphy, Donal McCarthy, Eoin Cotter, Ciaran Sheehan, Daniel Goulding, Conor O'Driscoll, John Hayes, Donncha O'Connor, Brian O'Regan, Patrick Kelly, Paul Kerrigan, Sean Kiely, Michael O'Leary, Daniel Lane, Jim Nolan. Centre: Tommy Lynch, Gerard Lane, Aidan O'Connell, Colin Lane, Derek Kavanagh, Paul O'Flynn, Alan O'Connor, Colm O'Neill, Kevin McMahon, Alan Quirke, Ken O'Halloran, Paddy O'Shea, Fiachra Lynch, Fintan Goold, Ger Spillane, Nicholas Murphy, Aidan Walsh, Pearse O'Neill, Eoin O'Neill, Mick Curtin, Kevin Clancy, Dr. Con Murphy. Front: Terry O'Neill, Pearse Murphy, Ray Carey, Anthony Lynch, Eoin Cadogan, Noel O'Leary, Conor Counihan, Graham Canty, Jerry O'Sullivan, Michael Shields, Frank Murphy, Paudie Kissane, John Miskella, Jamie O'Sullivan, Kieran O'Connor, Peadar Healy, Ger O'Sullivan. 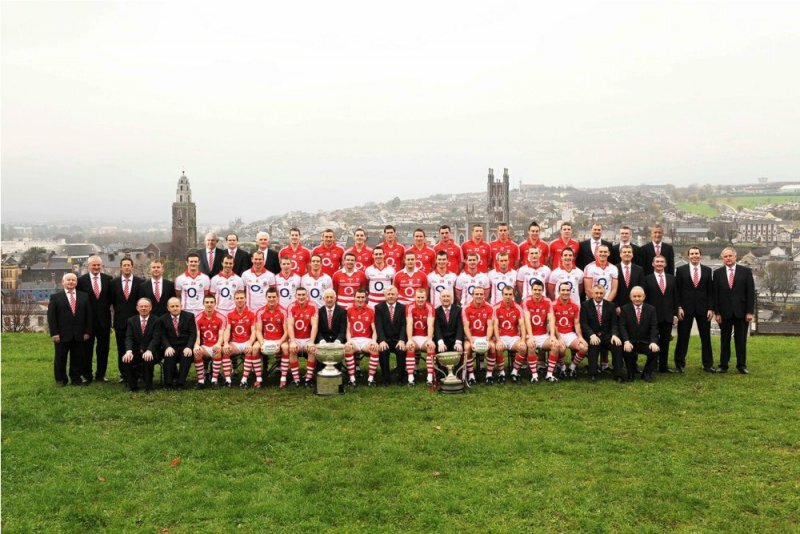 Cork have finally reached the Promised Land. After two heartbreaking All-Ireland final defeats in the last three years, the Rebels reclaimed Sam Maguire for the first time since 1990 after a 0-16 to 0-15 GAA Football All-Ireland final defeat of Down at Croke Park on Sunday. As always, this Cork team did it the hard way. They trailed by 0-8 to 0-5 at half-time after an anemic first half performance, but they turned the game on its head after the break, with the experience of substitutes Graham Canty and Nicholas Murphy helping the Rebels over the line in a frantic finale. Having led early on, Cork were behind from the 14th until the 56th minute, when Paul Kerrigan's point put them back into a lead they would not let go. Kerrigan's was the first of three successive scores and it proved to be the winning break for the line, leaving Cork in a winning position three points clear with three minutes left on the clock. Having built up their lead with the help of Daniel Goulding's nine-point haul, Cork then had a great chance to put the game out of reach, but Colm O'Neill's shot hit a defender and rebounded off a post. It was never going to be straight forward. It never is with the Cork footballers. Down hit back, Benny Coulter finally freeing himself of the limpet-like Michael Shields to cut the gap. Then, two minutes into added time, Danny Hughes fisted a ball over the bar to leave just a point between the sides. Rebel hearts began to flutter. However, this was to be Cork's day of days. Nobody could deny them the All-Ireland title they have craved. Not now. When referee David Coldrick blew the full-time whistle the initial relief of lifting that great weight soon turned to joy. Once again, Cork answered all the questions that have been posed about their collective character. Questions that arose after losing the 2007 and '09 finals. Their focus was in evidence in the final minutes of the semi-final win over Dublin, when Donncha O'Connor cashed in their get out of jail free card. O'Connor was immense again on Sunday, hitting five points, three from play, and acting as the target man at the apex of the Cork attack. They sought him out with direct ball from the back and the Ballydesmond man enjoyed a fine afternoon in Croke Park. Cork came good when it mattered, in the final game of a season in which they had been criticised for failing to match the performances of previous campaigns. That big game the experts suspected was in them materialised on the third Sunday in September, just when manager Conor Counihan would have wanted it. Credit will go to Counihan for his adroit tactical game plan and for utilising Canty and Murphy, both struggling with injury, sparingly and when they really needed them most. Murphy helped to turn the game in Cork's favour, dominating midfield with Aidan Walsh. Murphy replaced Alan O'Connor at half-time and his arrival was the winning of the match for the Rebels. In the absence of their injured captain, Ambrose Rogers, Down were drowning in the middle of the park. "The third quarter was a problem and primary possession seemed to be a problem," Down boss James McCartan admitted afterwards. "At times it seemed that we would let them win the ball and try to take it off them. It worked for some periods, but we would be dissatisfied with the amount of clean catches we allowed them have. It is definitely the area we had problems with." Cork also cleverly curbed the influence of Down's two most dangerous players, Benny Coulter and Martin Clarke. Clarke was brilliantly shadowed by Noel O'Leary and failed to score from play, while the only change Coulter got from Shields was a single late point. Rumours that Canty would not be fit to take his place in the Cork team after weeks battling hamstring problems were borne out when it was Shields who led the Rebels out onto the field. John Miskella, the All Star defender, was drafted into the side in his place while Shields was handed man-marking duties on Down danger man Coulter. Noel O'Leary went head-to-head with Martin Clarke, the Mourne County's playmaker. Cork started impressively. Alan O'Connor sent an early effort wide, but the Rebels were finding gaps in the Down defence. Ciaran Sheehan burst through a chasm in the opening minute and was only denied by a brilliant save from the feet of Brendan McVeigh, the Down goalkeeper. The ball rebounded to Sheehan whose fisted effort was blocked on the line by the backtracking Dan McCartan. Down did not escape completely unpunished, though, as Cork took an early lead through a Daniel Goulding free. Danny Hughes had Down level in the fifth minute, taking a pass from Martin Clarke - who was starting to conduct the play from the 40-yard line - and slotting over a fine score with his right foot. Cork struggled to reach the pitch of the game in the opening quarter and their forwards were second to many if the direct balls being delivered into their attack - clearly a ploy to test the Down full-back line. Cork, however, looked nervous as they returned to the All-Ireland final stage, frequently coughing up posession and kicking some alarming wides, with Miskella and Kerrigan both guilty. Down were less profligate, kicking four points without reply in a four-minute spell to wrest control of the game. Martin Clarke kicked a pair of frees, while his older brother, John, profited from Alan Quirke's slip when kicking out the ball. Down would stretch their lead when Paul McComiskey added his second and Hughes used his pace to ease past Paudie Kissane on the outside and fist over the bar from a tight angle. At 0-7 to 0-2, Cork were in trouble and nothing in their play to that point suggested they were capable of turning things around. There were some green shoots, however, in the closing five minutes of the half. Donncha O'Connor closed the gap back to four when he kicked his side's first points for 18 minutes from a free. The Rebels gained sustenance from that score and their best passage of play in the opening half quickly followed. O'Connor was fed quick ball and he offloaded to Pearse O'Neill, who snapped a pass to Goulding. The Ãire Ãg man cracked over a fine point. It was just what the doctor ordered and a glimpse at what Cork were capable of. Down hit back with Martin Clarke's third free, but Cork had the last say in the half, O'Connor kicking a brilliant point from play after Aidan Walsh's quick free. Cork were colourless and flat in the first half and yet they trailed by just three points, 0-8 to 0-5, at half-time. Again, Down were first out of the blocks on the resumption. McComiskey kicked them four clear before Cork finally made use of the abundance of ball they had in the middle third. The quality of ball going into the forwards changed dramatically. Goulding and O'Connor showed for the ball and it was sent in to them quickly and accurately. The entire Cork full-forward line of Goulding, O'Connor and Sheehan were on target in a four-minute spell up to the 51st minute and Cork had drawn level at 0-10 apiece. Kevin McKernan stuck his finger in the dam with a trademark run and point from centre-back, but Counihan's men had the bit between their teeth. Three more points came without reply. Goulding nailed two â45s and Kerrigan did his bit to ensure he followed in the footsteps of his father, who won All-Ireland medals with the Rebels in 1989 and '90. He was well on his way. Peter Fitzpatrick and Ronan Murtagh hit back for the Mourne men, but Donncha O'Connor proved his value to the team with yet another superb score from play, this time putting Cork back into a three-point lead with an inspirational score from a tight angle. It was then that Cork could have avoided the dreaded, shredded nerve finale, but Colm O'Neill's deflected shot appeared frozen in time as it dribbled off a post. In the end it didn't matter, as Cork held on for the win. Just. Cork: Alan Quirke; Eoin Cadogan, Michael Shields, Ray Carey; Noel O'Leary, John Miskella, Paudie Kissane; Alan O'Connor, Aidan Walsh; CiarÃ¡n Sheehan (0-1), Pearse O'Neill, Patrick Kelly; Daniel Goulding (0-9, 0-3 '45, 0-4f), Donncha O'Connor (0-5, 0-2f), Paul Kerrigan 0-1. Subs: Nicholas Murphy for A O'Connor (HT), Graham Canty for Kissane '42, Colm O'Neill for P O'Neill '56, Derek Kavanagh for Murphy '66, John Hayes for Kerrigan '69. Down: B McVeigh; D McCartan, D Gordon, D Rafferty; D Rooney, K McKernan (0-1), C Garvey; P Fitzpatrick (0-1), K King; D Hughes (0-3), M Poland (0-1), P McComiskey (0-3); B Coulter (0-1), J Clarke (0-1), M Clarke (0-3, 0-3f). Subs: C Maginn for J Clarke '45, R Murtagh (0-1) for McComiskey '56, B McArdle for Rafferty '58, A Brannigan for King '65, C Laverty for Poland '66.